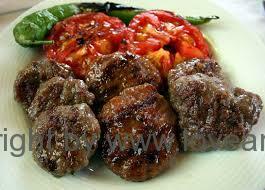 I would almost say, that you haven’t been to Turkey, if you haven´t tasted the real delicious turkish meatball – Köfte. Period!! This is real Turkish food. And I’m not talking about those made of fish, potatoes, carrots, squash og what else, you can find. I’m talking about the real ones made of meat – preferable og lamb and veal. You simply can’t get around this little treat, as they are available im most places either as genuine authentic grilled, as pre-made fastfood, at grandma’s own and in many, many, many different versions depending on region and taste. You will not get the same meatball twice (unless it’s a fast food chain serving them) and it’s really quite nice as there are endless possibilities for variations and different taste and impression. Köfte is a real national eating and served with pride.Every regio and every family has their own recipe, som with chili, some without, some with several different spices as cumin and nutmeg, some with more or less parsley, garlic, tomato paste and bread crumbs. But the main ingredients are always the same. 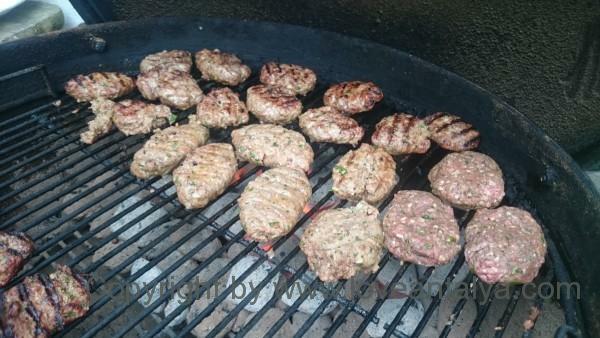 I got köfte for the first time my turkish mother-in-law invited mere home for dinner – and since I have made them 1000’s of times, for family, friends and guests, who always asks fo them. Even when my kids schoolmates are going to eat here, they kindly order köfte in advance 😀 . They taste almost equally well whether they are straight fror the pan or the grill. But I prefer them from they grill, as they are sizzly and has that little smoked flavor, that just make them extra good. If you really must give a treat and make it all special, you must cook them over a wooden fire, not coal, which we mostly have at home. 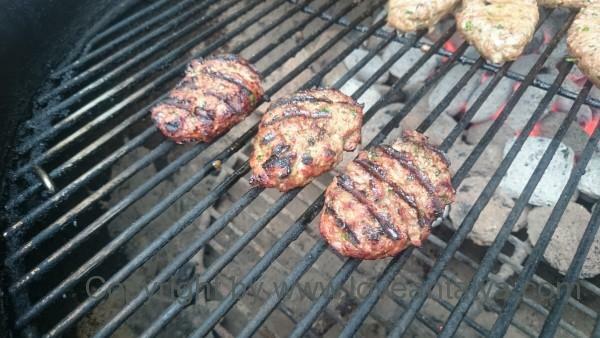 Köfte is actually quite easy to make. I never follow a recipe, but takes it more by eye untill the stuffing looks right. As with any Turkish food, you should not go down on fats – it means – chose meat with a higher fat content, than you usually use (this is specially important if you chose to grill, as most of it will drip off) or fry them in plenty of butter. Genuine Turks will adamantly claim, that all the taste and flavor is in the fat and it´s probably not entirely wrong. This recipe is enough for about 4-5 people, but if they’re very hungry or just very happy for Turkish meatballs, then make a double portion. You may be lucky, there is left-overs till the next day for lunch, the kids school lunch or small bites during the day. For they’ll be eaten – trust me !!! You may want to add 2 tablespoons of lemon juice or a bit og rosemary to get a little stronger flavor. I usually chop the onion, garlic and parsley in a mini chopper, as this goes any faster, but chop it in hand, if you have good time and enjoy preparing the food. The scents and the experience is not quite the same in a mini chopper, and it’s at least as large a part of preparing a good Turkish meal, as it is being served. Then you mix it all together and let it stand for about 30 minutes, so the stuffing get time to accumulate and the flavors develop. Then you form them by hand, you can also use a spoon, but I usually form them by hand and then shape some little oblong meatballs, so they just feels good in the hand. I do not make them tremendously large (though slightly larger if they are on the grill, so they are not so easily fall apart), but you can make them just the way you want, round, oblong, square, or what you think is right. If you fry in the pan then fry them in plenty of butter and a good splash of oil – it gives all something to taste. If you grill them, brush them if necessary. with a little oil ( it’s not necessary if the meat got a high percentage of fat). Trust me – you do not want small dry pieces of meat after cooking,but rather a delicious little greasy meatball full of flavor. Serve possibly with rice, fried eggplant, bean salat and good bread. Afiyet olsun – Enjoy the refreshments. « Typisk tyrkisk …. auberginesalat med youghurt.